The blank screen is torture. The only thing worse is a filled screen and a mere trickle of metrics. Content that doesn’t connect is as worthless as a blank screen. In fact, it’s more than worthless: It’s costly. The struggle is universal. How do you create content that connects with your audience? That’s the billion-dollar question. I reached out to 21 content marketers and asked for their No. 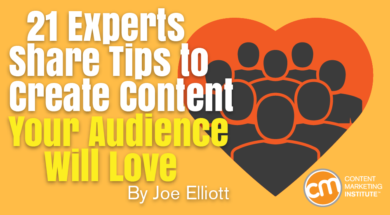 1 tip to create content their audience will love. Let’s not waste another minute; let’s dive into the results! Know thy goals. Content marketers often have stars in their eyes when it comes to traffic, social shares, and their email list. Nonsense. Bigger isn’t better on any of those fronts. You need to understand who the big players are in the community on social media and you need to understand what gets interaction and engagement and what doesn’t. The biggest mistake I see is creating content that is focused on you, and not the audience. I hate to break it to you, but your readers don’t care about you! They care about solving their problems. The more you help your readers with what they care about, the more they’ll come back, read your posts, and become loyal readers. It all starts with your ability to research your audience. What is their biggest struggle that keeps them up at night? And more importantly, how can your content help them? The key is to engage with your readers and actually have a conversation with them. This can be done in the comment section on your blog (or a blog with the same target audience), by emailing them, or through social media. You can validate your content ideas in a Facebook Group, a Quora question, or even just by emailing people who are interested in what your new blog is about. One of my favorite approaches to validate my content ideas is with an onsite survey carried out with Qualaroo. I put a quick, one-question survey on a Facebook group that says something like, “I’m working on a new blog post. Which of these topics are you most interested in learning more about?” Visitor responses help me separate the great from the good. What other (your niche) sites do you frequent? Please tell me the names. What interested you in joining my list? Now you have qualitative data to give your audience more of what they want from you. If you already have a following and/or email subscribers – put together a survey in Typeform (the free version will do). Read the comments on popular blogs in your niche. Listen to what people are saying on Twitter. Attend the Q&A calls and webinars other authorities are holding, and write down the questions people ask. And then look for patterns. Almost always, you’ll find one or two questions everyone is asking over and over again, and it never seems to stop. That’s what you need to be writing about. Before writing anything, you should start by creating personas for the various groups of your audience. For example, you may have both B2C and B2B audience segments visiting your site. If you create personas, by outlining the different needs and pain points of each segment, you can create content around providing solutions and fulfilling needs for these people. Making sure you have content that fulfills all of their needs and intent, all the way through the conversion funnel, will ensure you’re creating the right content for the right audience at the right time of their journey. My best tip is to know who you’re talking to. Have what’s called a client avatar (a fully fleshed out example of your target market or average blog reader) and write to that person. Don’t write for SEO. Don’t write to everyone. Instead, write to one very specific person. Is that person male or female? How old is the person? What does the person do for a living? How about hobbies or interests? If you try to write to everyone, you’ll really be writing to no one. Include a feedback button of some sort. This button is there to consistently ask your audience what they want to see or what questions they want answered. You can also use this method to quiz them on what kind of content they love the most when it comes to your niche. You might be surprised that a large portion of your audience prefers infographics, or maybe even audio that could set you off down the road of creating a podcast in addition to a blog. I always recommend people or brands focus on small niche market audiences. A great example of this can be seen with sports. The “sports” topic in itself is way too generic, and if someone wanted to get scores or highlights they would go to ESPN. However, if you drill this down several times and focus on something like “basketball jump training,” you can then cover every aspect of this tight focus in detail … thus always giving your audience the best content possible. The best way to create content that your audience will love, is to go offline and talk to them long before you start crafting blog posts, writing sales pages, or structuring your lead magnets. Find 10 to 20 people within your target market and ask them if they’d be willing to chat on the phone, meet in person for coffee, or grab lunch. Prepare a list of questions and assumptions about what you think your audience wants to learn about and get better at. Go into your conversations with an open mind, without too many firmly held assumptions about the needs of your readers. Then, listen. Take notes about what your audience is telling you their biggest pain points are and make a prioritized list of content topics that can begin to chip away at their most significant challenges. With book writing, it’s always about making the content interesting and always keeping the reader wanting to flip to that next page. I think this is something that is lacking with online content creation today, as more people are focused on just putting content out there and not so much about actually providing value and making it their best work possible. With all of that in mind, always focus on the end user and make them want to keep reading more. I like to create expert interviews or summary style posts. The benefit of creating these types of posts is that I can start with my own content and outreach, then fill up the bulk of the content with expert advice or resources from other locations. For example, if I wanted to create an article, 7 of the Best Free Email Reports for 2017, I could highlight seven different email reports already out there, do a short write-up on each, include a screenshot, and link back to the original source. Once the article goes live, I can then reach out to the sites mentioned within the article, and ask them to promote it on their end. Here’s the thing, there’s nothing new under the sun. Instead of trying to go head to head with established names in your niche by doing what they’re doing, tell a story. We’re hardwired to love a good story. It removes all our defenses and lets us learn lessons while being entertained. Tell stories about your experiences with the problem you’re helping them solve. Tell stories about inspirational people. Tell stories about the underdog. The people who’re reading your content may forgive everything from spelling mistakes to bad grammar, but they won’t forgive a bad story. Tell yours like a champ. Document in a spreadsheet the questions people ask in forums and communities in your niche. Make a comprehensive blog post answering the questions you like. Once you have done that, just go back to the forum and write a short answer with a link to your post for a more detailed answer. An excellent way to create better content for your audience while also increasing engagement is to include original images, infographics, and video content. Gone are the days when just text content is enough, now it’s all about shareable content and making sure your readers see the value in what you produce. A perfect example of this would be if you were writing a report on the latest industry trends and stats. Sure, the article is great in itself, but imagine how much more value it would serve to have custom charts, graphs, and even an original infographic to help complement your content as well. I hated writing, but used to write blog posts all the time. It would take me forever but I thought that’s what you had to do to find your voice and get better. Then, I decided to start a podcast and video web show. It’s so much easier to create content, and now I hire ghostwriters to do the writing that I don’t like. Creating great content is all about the relationship with your audience. Anyone can create a website and throw content online, but who is to say the trust factor and relationship is there? For this to take place, not only do you need to provide value within your content, you need to make sure its data is backed up with recent and reliable sources as well. A perfect example of this would be if you were to create an “industry stats” post on whatever market you might be. It’s easy to pull stats from anywhere or even come up with your own, but who’s to say these numbers are accurate. If you put in the time and effort to make sure all sources are cited, your content will not only provide more value and gain trust, it will likely be picked up by other publications as well. Taking the time to understand your audience is the only way to increase your engagement and your overall results. Thankfully, that’s far from an impossible task. Stop relying on instinct and your own creativity. Get out there and talk to your audience, directly, indirectly, and through aggregate tools built around data. And think about how to get out of a content rut to stand out in a field of crowded content. What is your best tip for creating content your audience will love? Want daily tips to help your content marketing program? Subscribe to the free CMI newsletter. Joe Elliott is the founder and author of OneManWiki, a blog dedicated to helping people create a thriving blog! He also puts videos out on his YouTube Channel. He loves to try different things to create fresh strategies that deliver results, traffic, and growth for his audience. When Joe is not writing, he likes to get out and explore the Scottish Wilderness. Follow him on Twitter @JoeElliottSYDJ.